Understanding Colorado “Detox Holds” Law – 27-81-101 And 27-81-111 C.R.S. – Every year many innocent people are taken into custody “for their own good” when they are intoxicated or high on drugs- or both. These so called “emergency holds” or “emergency commitments” can be terrible experiences for those arrested and they can have devastating consequences. Yet little is published online about this procedure of involuntary arrest in the absence of the suspected commission of a criminal act. This article is intended to help all of us understand how these so called “detox holds” work. 2. The detoxification program involved approves the administrator or designee. 1. The Person is ntoxicated and clearly dangerous to the health and safety of himself or herself and others. 2. The Person is incapacitated and clearly dangerous to the health and safety of himself or herself and others. “Intoxicated Person” – means any person whose mental or physical functioning is temporarily but substantially impaired as a result of the presence of alcohol in the body. “Incapacitated by Alcohol” – means that a person, as a result of the use of alcohol, is unconscious or has his or her judgment otherwise so impaired that he or she is incapable of realizing and making a rational decision with the respect to his or her need for treatment or is unable to take care of his or her basic personal needs or safety or lacks sufficient understanding or capacity to make or communicate rational decisions concerning his or her person. There must be facts supporting the need for emergency commitment and the clearly dangerous behavior based on the personal observations of the applicant and – or the specific statements of others, if any. The application itself must contain facts, statements, and information that support the alleged grounds for commitment. A licensed detoxification program’s administrator or authorized designee determines must find that the grounds for commitment meet the necessary criteria for emergency commitment. If a licensed program’s administrator or authorized designee determines that the grounds for an emergency commitment do not exist, the application must be denied and the person encouraged to seek voluntary treatment. If grounds are found to exists, the application is then signed, dated and the time documented on the application. The emergency commitment period of up to 5 days begins to run. If a Colorado citizen is committed for evaluation and treatment – the term is not longer than five day it is NOT a “five-day hold.” Each program not only has the discretion to shorten that time frame of an “emergency commitment – detox” they are obligated to lessen the time with a referral to “voluntary” treatment – if appropriate – sooner than five days. When analyzing the urgency and the ulitimate need for an emergency commitment – the licensed professional is bound by certain legal definitions and guidelines. One of these is answering the question – How imminent is this emergency? “imminent” as it applies to the proximity in time of the dangerousness. The term “imminent” applies to a determination of whether the danger to others or himself or herself is current; it does not apply to how soon in time a specific dangerous act may be undertaken. Pursuant to the Provisions of Section 27-81-112, C.R.S. You are hereby notified that you have been accepted for emergency treatment on the basis of the application for emergency commitment as shown above and shall be given a copy of this application. You are further advised that you may be held for treatment until the grounds for emergency commitment no longer exist. In no event may you be held for a period longer than five (5) days unless a petition for involuntary commitment has been filed with the court. If a petition for involuntary commitment is filed with the court, you may be held until the petition is heard and determined but in no event may you be held for a period longer than ten (10) days from the filing of the petition. You have a right to challenge such detention by application to the courts for a writ of habeas corpus, to consult with and be represented by counsel at every state of any proceedings relating to your commitment and recommitment and to have counsel appointed by the court or provided by the court if you want assistance and are unable to obtain counsel. Detox Centers euphemistically call themselves “social detox facilities.” Private organizations such as Arapahoe House provide the police a location to place people that are overly inebriated on drugs and alcohol to …sober up. Usually the stay in these facilities is less than 48 hours. While “social detox” centers claim to have professionals such as addiction counselors and social workers on hand to help connect the detoxified with resources, the reality is they provide a cot to sleep it off at rates that rival the best hotels in Denver. Police choose detox centers over emergency rooms, often making the decision based on the officer’s lay appraisal of the subject’s overall level of intoxication mental state. That decision can have enormous consequences as described below. What Exactly IS The Definition Of Detoxification? Detoxification is a set of interventions aimed at managing acute intoxication and withdrawal. It denotes a clearing of toxins from the body of the patient who is acutely intoxicated and/or dependent on substances of abuse. Detoxification seeks to minimize the physical harm caused by the abuse of substances. 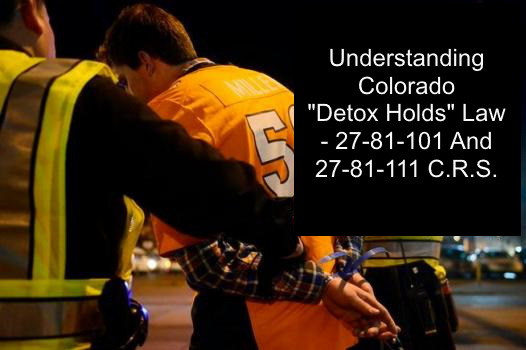 Colorado Detox facilities calculate a detained individual’s release time as the time when they “blow” – (after a Breathalyzer test) – “triple zeros.” Put another way, those admitted to “detox” are only discharged when no substance withdrawal symptoms are present and blood alcohol levels are at 0.00. That averages out to a detox stay of between 12 hours to three days. When Alleged Detoxification Becomes Abuse – Crossing The Line – What Can Go Wrong In Detox Cases? Civil lawsuits arising from emergency detox commitments have been filed. The Denver Police Department (“DPD”) and Denver CARES’ collusive policy and practice of forcibly detaining intoxicated individuals under the guise of providing consensual medical care to generate revenue for the City and County of Denver and the Denver Health and Hospital Authority (“DHHA”). Though there is a statute authorizing the emergency commitment of intoxicated or incapacitated individuals who clearly pose a threat to their own or others’ safety, neither DPD nor Denver CARES invoked or followed the mandates of that statute when they took custody of, detained, and incarcerated Mr. Cornell and Ms. Rodriguez for the pretextual purpose of treating their alcohol intoxication. To end DPD and Denver CARES’ collusive practice of extorting money from law abiding citizens who do not consent to Denver CARES’ “treatment” in order to fund the Denver CARES program. The Fourth and Fourteenth Amendments to the U.S. Constitution; Article II, Section 25, of the Colorado Constitution; and the common law tort of false imprisonment. 1. To patrol areas where there are likely to be masses of people who have become intoxicated legally such as sporting events, night clubs and bars on weekend nights. 2. To take custody of and transport intoxicated individuals to Detox Centers without having probable cause to believe that they are a danger to themselves or others. The practice of “vacuuming up” hundreds of inebriated people on the streets of the Denver Metro Area every year and incarcerating them in Detox Facilities with little evidence that they actually pose a danger to themselves or others – other than they are intoxicated – must be examined from a public policy standpoint. But the law also is clear that the Colorado General Assembly never intended the police to take into protective custody every intoxicated person they meet. Individuals that are subject to arrest under this law requires that the specific class of intoxicated persons who are subject to emergency commitment must be clearly dangerous to themselves or to others. The law leaves this determination – to take someone into protective custody – to the discretion of the police and then blankets their decision with immunity from lawsuits for making the decision. The law does not classify the “detention” of protective custody as an arrest and there is no requirement that the officers suspect involvement in any kind of criminal activity. The only protection – the only standard – applied to this situation is that the officer must have probable cause to believe that the person is sufficiently intoxicated as to be a danger to himself, herself, or others, given the totality of the circumstances. This, it turns out, is a very low bar for taking someone into custody against their will. (1) It is the policy of this state that persons with alcohol use disorders and intoxicated persons may not be subjected to criminal prosecution because of their consumption of alcoholic beverages but rather should be afforded a continuum of treatment so they may lead normal lives as productive members of society. The general assembly finds and declares that alcohol use disorders and intoxication are matters of statewide concern. (2) With the passage of this article 81 at its first regular session in 1973, the forty-ninth general assembly recognized the character and pervasiveness of alcohol abuse and alcohol use disorders and that public intoxication and alcohol use disorders are health problems that should be handled by public health rather than criminal procedures. The general assembly further finds and declares that no other health problem has been so seriously neglected and that, while the costs of dealing with the problem are burdensome, the social and economic costs and the waste of human resources caused by alcohol abuse and alcohol use disorders are massive, tragic, and no longer acceptable. The general assembly believes that the best interests of this state demand an across-the-board and locally oriented attack on the problem of massive alcohol abuse and alcohol use disorders and that this article 81will provide a base from which to launch the attack and reduce the tragic human loss, but only if adequately funded. Therefore, in response to the needs as determined by an ad hoc committee and to assist in the implementation of this article 81 at both the local and state level, the general assembly hereby appropriates money for: Receiving and screening centers and their staffs; medical detoxification; intensive treatment; halfway house care; outpatient rehabilitative therapy; orientation, education, and in-service training; staff for the administration, monitoring, and evaluation of the program; and operating costs for patient transportation. (1) (a) When a person is intoxicated or incapacitated by alcohol and clearly dangerous to the health and safety of himself, herself, or others, he or she shall be taken into protective custody by law enforcement authorities or an emergency service patrol, acting with probable cause, and placed in an approved treatment facility. If no such facilities are available, he or she may be detained in an emergency medical facility or jail, but only for so long as may be necessary to prevent injury to himself, herself, or others or to prevent a breach of the peace. If the person being detained is a juvenile, as defined in section 19-1-103(68), C.R.S., the juvenile shall be placed in a setting that is nonsecure and physically segregated by sight and sound from the adult offenders. A law enforcement officer or emergency service patrol officer, in detaining the person, is taking him or her into protective custody. In so doing, the detaining officer may protect himself or herself by reasonable methods but shall make every reasonable effort to protect the detainee’s health and safety. A taking into protective custody under this section is not an arrest, and no entry or other record shall be made to indicate that the person has been arrested or charged with a crime. Law enforcement or emergency service personnel who act in compliance with this section are acting in the course of their official duties and are not criminally or civilly liable therefor. Nothing in this subsection (1) shall preclude an intoxicated or incapacitated person who is not dangerous to the health and safety of himself, herself, or others from being assisted to his or her home or like location by the law enforcement officer or emergency service patrol officer. (b) A sheriff or police chief who violates the provisions of paragraph (a) of this subsection (1) related to detaining juveniles may be subject to a civil fine of no more than one thousand dollars. The decision to fine shall be based on prior violations of the provisions of paragraph (a) of this subsection (1) by the sheriff or police chief and the willingness of the sheriff or police chief to address the violations in order to comply with paragraph (a) of this subsection (1). 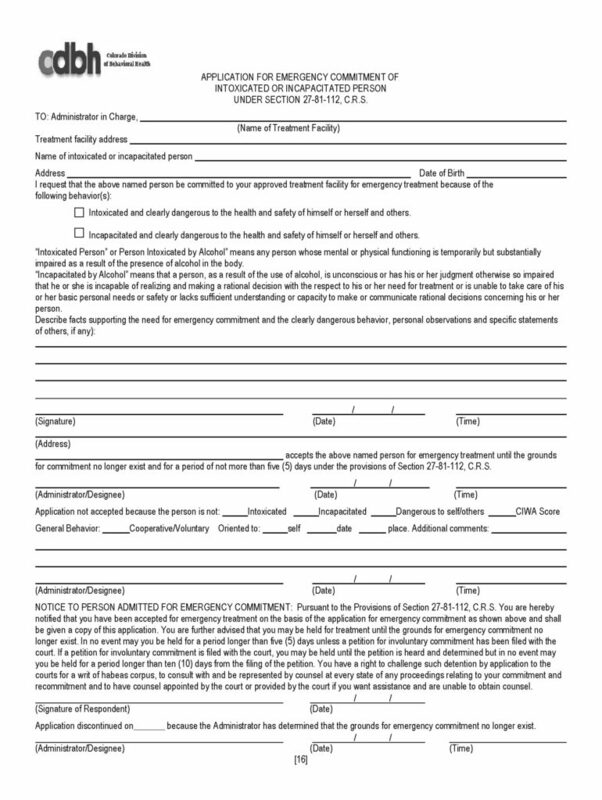 (2) A law enforcement officer, emergency service patrolman, physician, spouse, guardian, or relative of the person to be committed or any other responsible person may make a written application for emergency commitment under this section, directed to the administrator of the approved treatment facility. The application shall state the circumstances requiring emergency commitment, including the applicant’s personal observations and the specific statements of others, if any, upon which he or she relies in making the application. A copy of the application shall be furnished to the person to be committed. (3) If the approved treatment facility administrator or his or her authorized designee approves the application, the person shall be committed, evaluated, and treated for a period not to exceed five days. The person shall be brought to the facility by a peace officer, the emergency service patrol, or any interested person. If necessary, the court may be contacted to issue an order to the police, the peace officer’s department, or the sheriff’s department to transport the person to the facility. (4) If the approved treatment facility administrator or his or her authorized designee determines that the application fails to sustain the grounds for emergency commitment as set forth in subsection (1) of this section, the commitment shall be refused and the person detained immediately released, and the person shall be encouraged to seek voluntary treatment if appropriate. (5) When the administrator determines that the grounds for commitment no longer exist, he or she shall discharge the person committed under this section. A person committed under this section may not be detained in any treatment facility for more than five days; except that a person may be detained for longer than five days at the approved treatment facility if, in that period of time, a petition for involuntary commitment has been filed pursuant to section 27-81-112. A person may not be detained longer than ten days after the date of filing of the petition for involuntary commitment. (6) Whenever a person is involuntarily detained pursuant to this section, he or she shall immediately be advised by the facility administrator or his or her authorized designee, both orally and in writing, of his or her right to challenge such detention by application to the courts for a writ of habeas corpus, to be represented by counsel at every stage of any proceedings relating to his or her commitment and recommitment, and to have counsel appointed by the court or provided by the court if he or she wants the assistance of counsel and is unable to obtain counsel. (a) A parent, guardian, or other person entrusted with the care and supervision of a minor or an incompetent person, and a teacher or other person entrusted with the care and supervision of a minor, may use reasonable and appropriate physical force upon the minor or incompetent person when and to the extent it is reasonably necessary and appropriate to maintain discipline or promote the welfare of the minor or incompetent person. (b) A superintendent or other authorized official of a jail, prison, or correctional institution may, in order to maintain order and discipline, use reasonable and appropriate physical force when and to the extent that he reasonably believes it necessary to maintain order and discipline, but he may use deadly physical force only when he reasonably believes it necessary to prevent death or serious bodily injury. (c) A person responsible for the maintenance of order in a common carrier of passengers, or a person acting under his direction, may use reasonable and appropriate physical force when and to the extent that it is necessary to maintain order and discipline, but he may use deadly physical force only when it is reasonably necessary to prevent death or serious bodily injury. (d) A person acting under a reasonable belief that another person is about to commit suicide or to inflict serious bodily injury upon himself may use reasonable and appropriate physical force upon that person to the extent that it is reasonably necessary to thwart the result. (II) The treatment is administered in an emergency when the physician or advanced practice nurse reasonably believes that no one competent to consent can be consulted and that a reasonable person, wishing to safeguard the welfare of the patient, would consent. H. Michael works hard to get his clients the best possible results in and out of the courtroom. 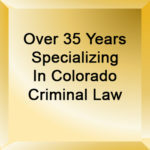 He has written, and continues to write, extensively on Colorado criminal law and he hopes this article helps you in some small way – Understanding Colorado “Detox Holds” Law – 27-81-101 And 27-81-111 C.R.S. Understanding Colorado "Detox Holds" Law - 27-81-101 And 27-81-111 C.R.S. Every year many innocent people are taken into custody "for their own good" when they are intoxicated or high on drugs- or both. These so called "emergency holds" or "emergency commitments" can be terrible experiences for those arrested and they can have devastating consequences. Yet little is published online about this procedure of involuntary arrest in the absence of the suspected commission of a criminal act.